The half halt - every rider's best friend - also happens to be an annoyingly elusive tactic that at first seems near impossible to grasp and is often near impossible to explain. If you are like me, you will have been told many a time to 'half halt'. When I was given this command previously, I would simply close my hands on the reins and try to slow my horse, but in reality, that has almost the opposite effect to a half halt. This brings me to my question: Just what IS a half halt? Surely it just means to check your horse and slow down a little, right? Wrong. A half halt is what in the culinary field might be referred to as 'an acquired taste'. Nobody can do it without learning how, but after a lot of practice, you should find yourself doing it almost automatically. Rather like how many people find they are able to enjoy sushi - after taking some time to get over the fact that they are eating raw fish, of course. Well, it is now my sad duty to inform you that the half halt actually has nothing to do with eating. Although you'll probably have worked up a hearty appetite by the end of all this. You see, the half halt is an extremely useful aid, though it is also extremely difficult to get right and if used incorrectly it can have opposite results, as I myself discovered on numerous occasions. From the dressage ring to a showjumping course, a half halt is an amazingly useful aid used by riders all around the world. It can be used to balance a horse, maintain rhythm, improve bend, keep them in a frame, get them working through their back and engaging their quarters, lift them off the forehand, stop them rushing and really just improve performance in general. It is something so subtle that, when done professionally, it will be invisible to spectators, though should result in a noticeable improvement in the horse's performance. 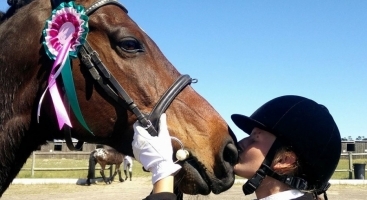 The half halt can improve your horse's performance. Now, to increase your understanding of the half halt, try to picture your horse as a high-pressure hose. Before you turn on the water, it is limp and floppy, and basically useless. Turn on the tap, and it will thrash around madly - yet with vast expanses of power. Your job is to contain this power. It's no good to you when it's spewing uselessly out of the end. However, if you place your thumb over the end of the hose, with the perfect amount of pressure, you can control that power and use it as you see fit. It is much the same with your horse. Use your legs to turn on the tap, and contain gently with your hands. It's no use letting the power you generate from your legs ooze uselessly into speed as the horse escapes through your hands, nor is it practical to contain the horse with your hands until you end up accidentally turning off the tap and ending up with something limp and floppy. If that was what we wanted, we could all just ride plush horses! 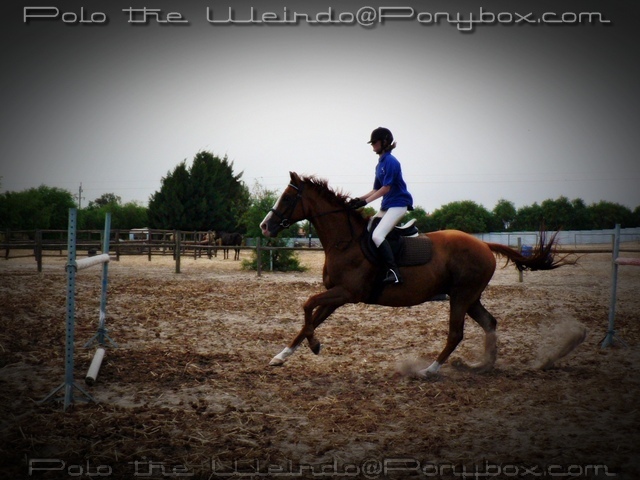 As such, you need to find the perfect balance between 'Whoa and Go' to get the appropriate impulsion from your horse. Once you have perfected this, and seen what you want from your horse, it is time to teach both yourself and your horse the half halt. Use the half halt to maintain impulsion between jumps. Start off in walk, moving along a 20m circle, a straight line, a serpentine... Whatever works best for you. Practice halting your horse using your seat - it won't help to use your hands, so use them ONLY if you absolutely have to enforce your seat halt aid. Every horse is trained differently, but I find what works to halt mine is to drop my weight into my heel and tense the muscles in my upper legs to lift my weight off the saddle slightly - also tipping my upper body forward just enough to shift my balance into something more like a light seat, but not enough for it to be visibly noticeable. What often helps is to think of squeezing with your thighs and literally trying to use your body weight and strength to bring your horse to a standstill. Just picture what you are aiming for clearly in your mind, and eventually your own method will come to you. 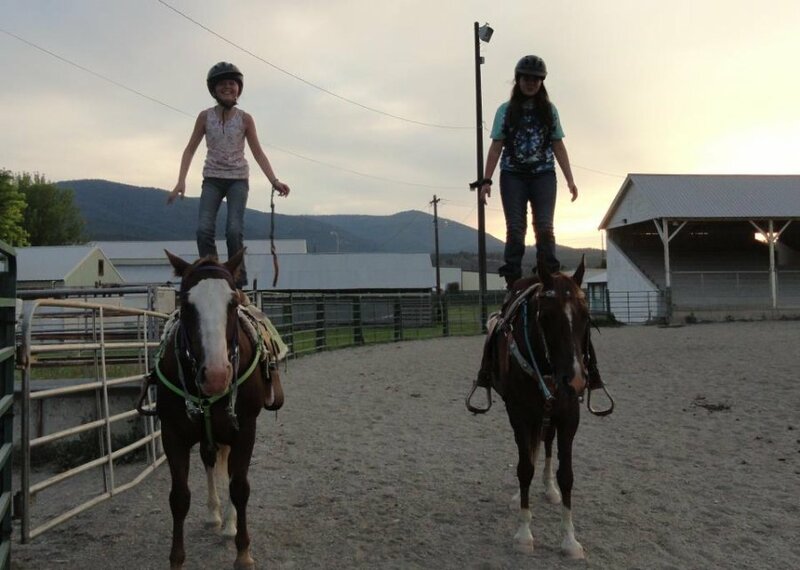 Practice this until your horse is halting obediently with little or no help from your hands. Once you have achieved this, it is time to begin with half halts. Ask for a halt, and just as you feel your horse tip his weight back to halt - push him forward again instantly. Exaggerate the aids. 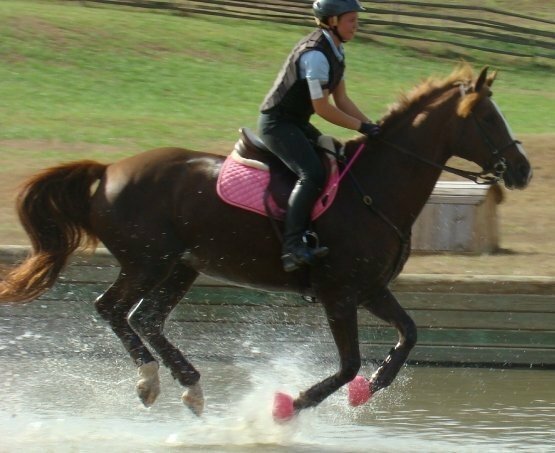 Come ALMOST to a standstill, then quickly but calmly nudge your horse on - trying to use a little more seat than leg in order to avoid rushing. Remember to do a full halt every so often so that your horse learns to distinguish between the two. 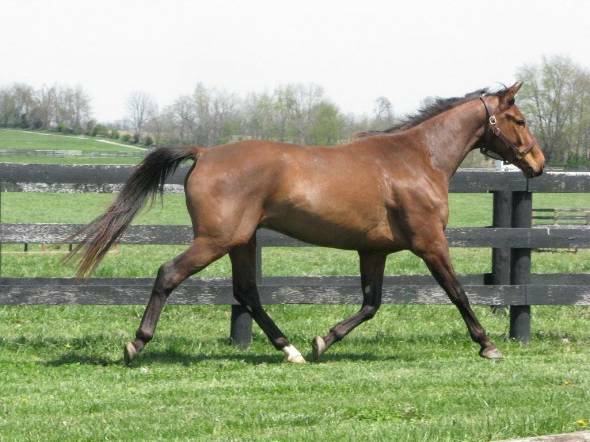 Once you have the desired result, and can feel the improvement in your horse after each half halt, it is time to make the aids subtler. Ask for halt, then push your horse on, but all within the space of one stride. You just want the horse to think 'halt' but not to actually lose its impulsion and attempt to halt. 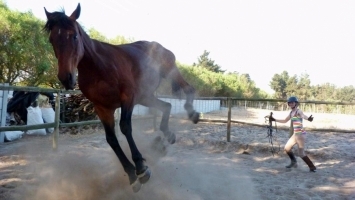 When a horse begins to prepare to slow to a lesser gate, it automatically steps under itself with its hind legs - engaging its quarters and working through its back, which in turn improves just about every other aspect of performance. If you can get your horse to think 'halt' for a split second before pushing it on again, you will have it moving forward and working with its quarters and back engaged - a result of having prepared to halt in that brief instant. 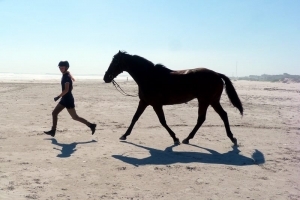 Once you are satisfied with your half-halts in walk, repeat the same procedure in trot and canter. After that, all there is to do is practice until you perfect it. 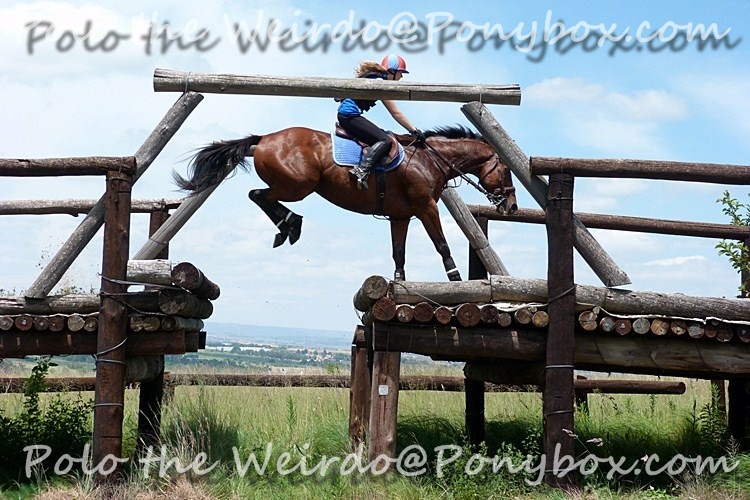 Try half halting in everything you do - jumping, hacks, flat work... Anything! Do it on circles, straights, serpentines and just about everywhere else you feel it can help. Another exercise I found particularly useful was to canter right around my arena and half-halt precisely every 4 strides. 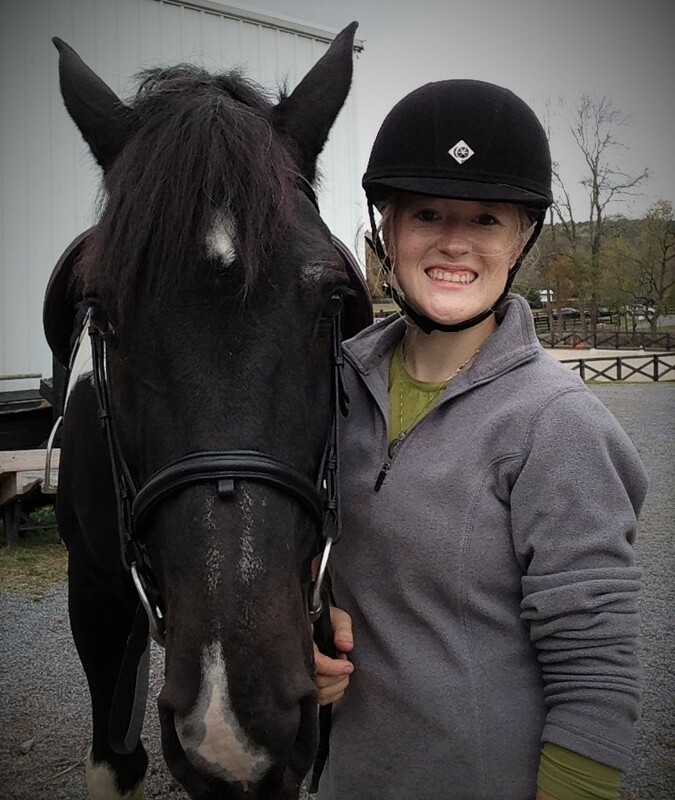 The improvement in my horse's balance, rhythm and impulsion were remarkable, not to mention the fact that she didn't fiddle or rush, as she ordinarily would have done. The half halt is a tricky thing indeed, but once perfected, its usefulness in any equine sport is completely and utterly unrivalled. 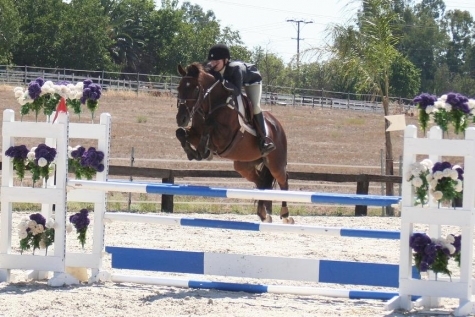 Use the half halt to discourage your horse from working on the forehand. Wow, you're amazing. I never understood it before, but now I do! Thanks, Polo! Wow!!! That helps a lot!! Thats a great explanation. Never would of thought of something like that :) The half halt used to confuse me so much lol. But I've been practicing it long enough now. 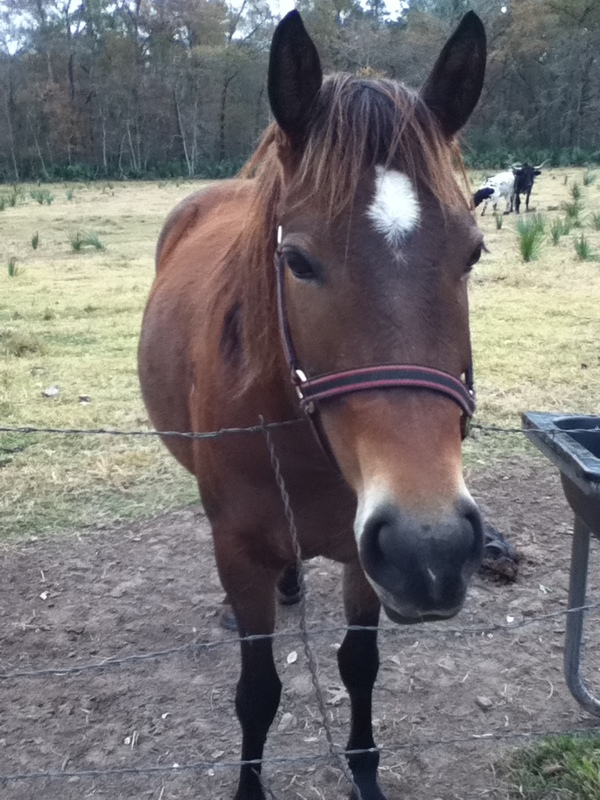 I love your horse it is pretty!!! I have to disagree with this entirely. 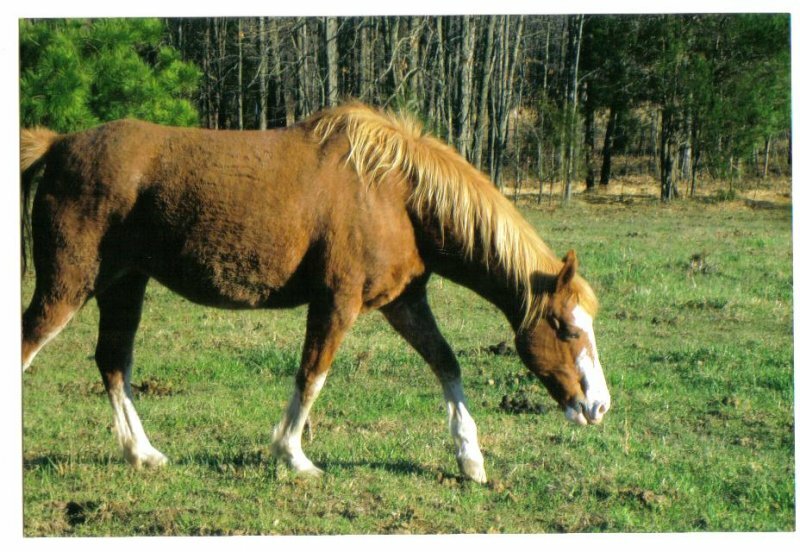 The method mentioned above is something that messes with all the fundamental training a horse has on how to stop. 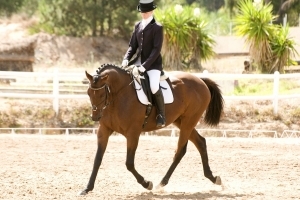 A half halt is simply the rider closing the rein pressure for an instant and then releasing, hence a 'half' halt. Asking the horse to stop and then pushing it forward before the halt is established is 'un' teaching the horse how to stop. If you follow through with this method then the next time you ask your horse to stop you will simply get hesitation, not the stop the horse was taught. I REALLY don't like this method at ALL. I find you'll just screw up the horse's training following this. Foxie: Thank you very much for your input! I greatly appreciate it! ^_^ But you see, this is not about 'half halting' as such, but about training the horse to respond to the half halt. :) Perhaps I worded it badly, or perhaps you just missed a little when reading it, but I was trying to explain that one ought to exaggerate their half halt aids when first teaching the horse to respond to help them to understand. Then, once the horse learns the exaggerated aids you can make them more subtle and get the desired result. :) I fully understand that your methods may be different and that you may not believe in mine, but I used this method on my own horse, Bronze, and I can promise you that his balance and obedience have improved beyond recognition since we both properly got the hang of the half halt after learning with these methods. :) Perhaps they're different to yours, but they worked brilliantly for me and my horse, so there is a chance the might work for others as well. ^_^ You're a superb rider, I'm sure you agree that every horse is different, and sometimes you have to try different methods. :D I am always delighted to hear of other possible methods, and if I like the sound of them, I'll try them out. ^_^ If not, well... Every horse is different, right? What works for one might not work for another. 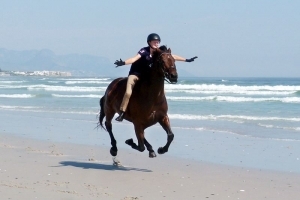 Sometimes you need to ride an unorthodox horse with unorthodox methods... :) Adaptation! :P Hehe! Foxie: A half halt can be a combination of your hand, seat or leg. 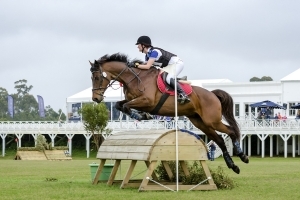 When galloping on cross country you ideally should be able to roll your shoulders back and put more weight into the back of your calf and bring your seat lower to the saddle, while your hands stay the same. The horse should rock its momentum and balance back onto its hind end. Lucy likes it when I use all three at the same time, Stormy likes my seat and leg, Mac would rather like my hands and leg. Reguardless you should have an even and consistent feel of the horses mouth. I do however disagree with the pictures you used as reference Polo. The horses are behind and below the vertical meaning they are avoiding the contact. 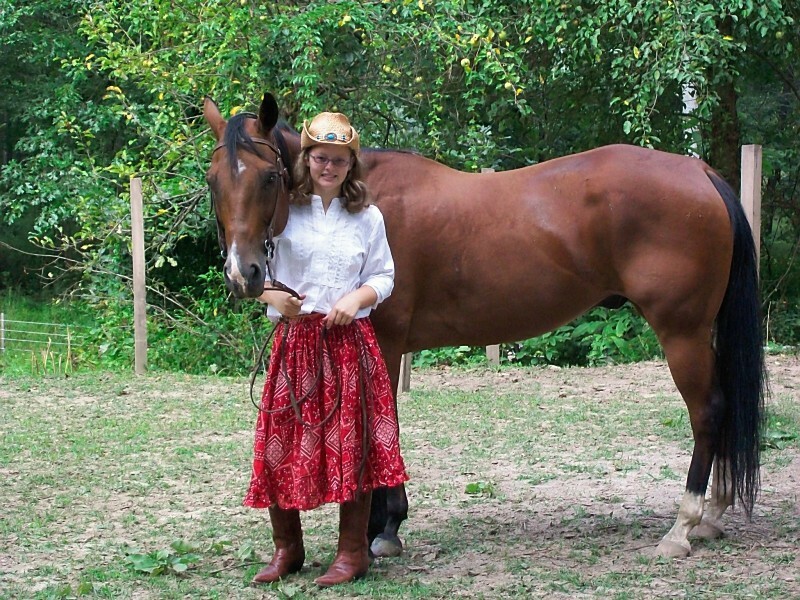 The purpose of the half halt is to make the horse rock its weight back onto its hind end by stepping under and forward, lifting its shoulder and going UP AND OUT into the contact. Down and back should never happen. If they do that you do not have enough feel of the mouth and hind end to carry the motion forward into correct balance and connection. 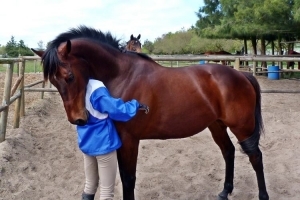 Bringing your hands up and forward will help them learn to step up into the contact and accept the bridle rather then going down and back and falling onto their hind end. The pictures show the opposite of what the half halt is suppose to achieve. I was always trained the way Foxie said....the half halt was putting pressure on the reins for an instant, and then releasing it. Now this just confuses me. =/ I halt with my seat and leg aids, and maybe reinforce it with rein pressure if I have to....but like Foxie said, I think you will end up untraining the horse from basic halt commands, because it will then keep thinking that it needs to hesitate, and then continue. I like our dressage stallion to halt when I tell him to. I don't need an out-of-control horse. I just see your horses behind and under the vertical, as Breezing Hill said. It's as if they're avoiding contact instead of pushing out and forwards like a true collected horse is supposed to do. To go along with what Foxie and Spyricale said, my moms mare (which I'm currently re-training) was taught to halt through the seat without any contact then back up. 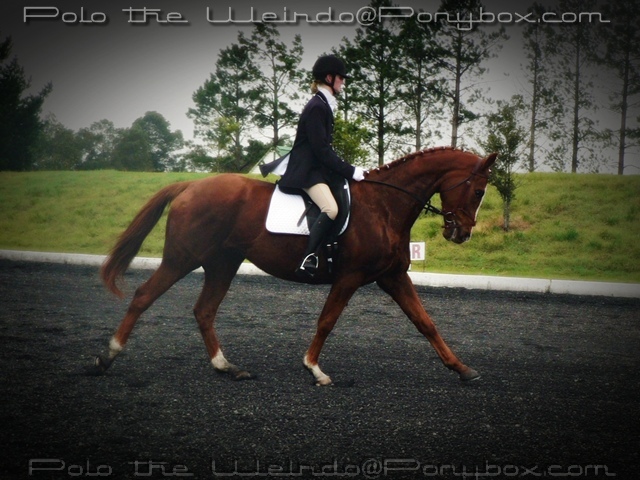 Now when I go to halt like I would down the centerline she steps back and becomes hallow. I now really have to think about raising my hands and getting her head up and sending her into a forward walk. I'm not saying training a half halt with the seat isnt correct, but I think that comes along further into the training. 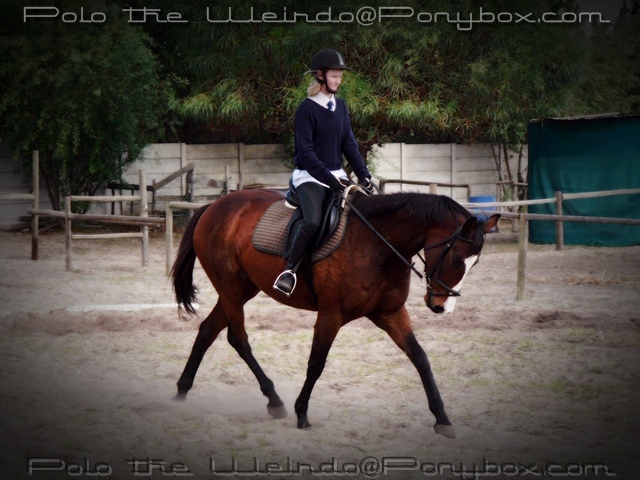 The horse first needs to respect the hand and then learn to step up into the bridle with your leg and seat. Foxie:Are you determined to go against everything Polo writes? Because it sure looks that way to me. Why don't you quit bugging her and have a look at what YOUR doing wrong with your horses.